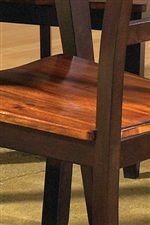 You'll have both a beautifully contrasting two tone look with the quality of solid wood with this leg table. It re-sizes with ease with its self storing butterfly leaf. 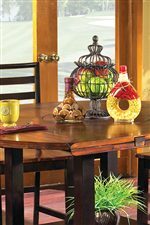 The attractive look of the solid acacia wood top will make this a focal point in any room, whether it be your dining, kitchen or family room, you're going to love it. 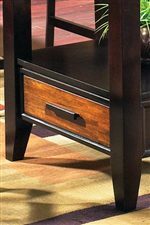 The Abaco Solid Wood Acacia Top Rectangular Leg Table with Self Storing Butterfly Leaf by Steve Silver at Walker's Furniture in the Spokane, Kennewick, Tri-Cities, Wenatchee, Coeur D’Alene, Yakima, Walla Walla, Umatilla, Moses Lake area. Product availability may vary. Contact us for the most current availability on this product.